I'd seen and heard about the AeroJacket Disc Cover from other triathletes, including Coach Tim down in Miami who has raced with his for quite some time. The idea is pretty simple: the Jacket is a low cost alternative to a traditional disc wheel. Seeing as how my budget doesn't allow me to even consider the purchase of a disc wheel, the AeroJacket was the next best (and only) option. Full disclosure: I reached out to the sales staff at Wheelbuilder.com and in exchange for my review of their product I received a discount from their regular pricing. As always, the arrangement has no bearing on my impressions and this review is my honest assessment of the product. The sales representative who helped me with my transaction was top notch; the service I received gave me the impression that all customers are handled with the same courtesy and professionalism. 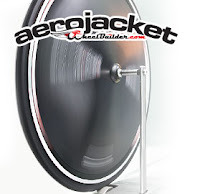 The ordering process for the AeroJacket is pretty straightforward: complete a simple online form which asks for a few important details about your wheel. The details required are easily obtained with a measuring tape (metric) and anyone should be able to get the needed info in minutes. Careful measurements and subsequent completion of the form ensures a successful fit for your custom cut Jacket. I took the required measurements, checked the necessary clearances, completed the form, and I was good to go. About five days later I received my wheel at work (they ship out of the West Coast so lead times may vary slightly). The oddly-shaped box drew some attention at work and my nosy coworkers were inquisitive about what these two pieces of plastic would do for me; so was I. Drive side: flatter disc half; has "align valve stem here" decal. Non-drive side: lens-shaped disc half; has valve stem hole cutout. 10 plastic fasteners (male/female pairs); 8 to do the job, 2 spares. Once the cassette has been removed from the wheel the first side of the Jacket is placed over the hub. The instructions recommend using masking tape to hold it in place; this will help when you flip the wheel over and put on the other side of the Jacket. Fastening the two sides together is the last official step of the install process. Somehow I missed the bright yellow "READ THIS CARD" which was in the package instructing me to push the fasteners together rather than screwing them. I mistakenly screwed them together and we will see how this affects the longevity of the fasteners; it did not affect the removal of the Jacket. Because they are made of plastic I can see these fasteners wearing out over time (with repeated installs/uninstalls) but they are cheap enough to replace if necessary. The Jacket fit snugly on my rim but I still chose to do as I've seen others do and use electrical tape to secure the seam of the Jacket and the rim dish. Given how simple it was to do I see no reason why everyone putting the Jacket on wouldn't just take this extra step to ensure that the Jacket will be as aerodynamic as possible and that no air would get inside. I was lucky enough to find some red electrical tape which my company sells and it ended up being a pretty cool accent to my bike frame. I know it's faint, but check the pin-stripe. Lastly, the Jacket comes with two stick-on covers for the valve stem cut-out. I can't speak to these much (like whether they are reusable or not) because I left them home on race day. Instead I had to get all MacGuyver with it and use what I had: I used strips of the red tape to seal off the hole which got me through the day. Don't forget to buy a presta adapter also known as a "crack pipe." With the Jacket installed you will no longer be able to fit the head of most pumps on the valve. The adapter will need to be attached to the pump and be held onto the valve (which pretty much means inflation is now a two-man job). If you are planning to put on your Jacket and then travel with your bike on a car rack keep in mind that the disc will catch a lot of air. I learned this the hard way when we made our first stop on the drive to Timberman. My bike had shifted its position on the hitch rack by at least 3 inches. I would suggest just removing the wheel and wrapping the chain into place to avoid this issue. 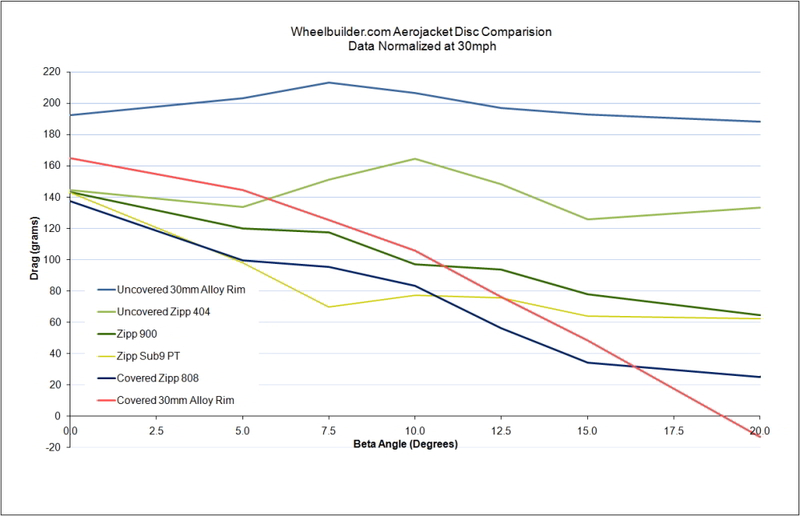 Though the performance of the Jacket is a bit hard for me to assess the logic is pretty straightforward: disc wheels have less drag (AeroJacket drag data) and the Jacket is a simple and inexpensive way to get a disc. I have only ridden with the Jacket twice (on the day before the race and on race day) because the instructions suggest not using it for prolonged training. Though I can't compare my performance at Timberman to what it may have been without the Jacket, one has to assume that it helped me to some degree: I had one of my best race-day bike rides. If not, well it looked pretty damned cool (especially with the red pinstripe)! 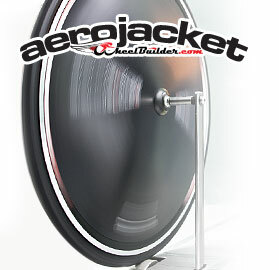 I would recommend the AeroJacket to anyone who wants an inexpensive race day upgrade. For those adventurous folks out there I'd say that you can attempt to make your own Jacket but I wonder if it would be more trouble than it's worth. 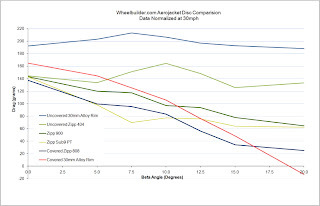 Thanks to the folks at Wheelbuilder.com for their assistance and for offering a low cost alternative to pricey disc wheels. I'll be racing with the Jacket for a while and am looking forward to putting it on before each of my races.